U2 provides a 5V regulated voltage reference. U1 is wired as a comparator, it compares the fixed 5V regulated voltage to the voltage on the wiper of VR1, that is proportional to the 12V supply. When the supply drops below the set point, the output of U1 goes low, turning on Q1 and powering the beeper and the LED. 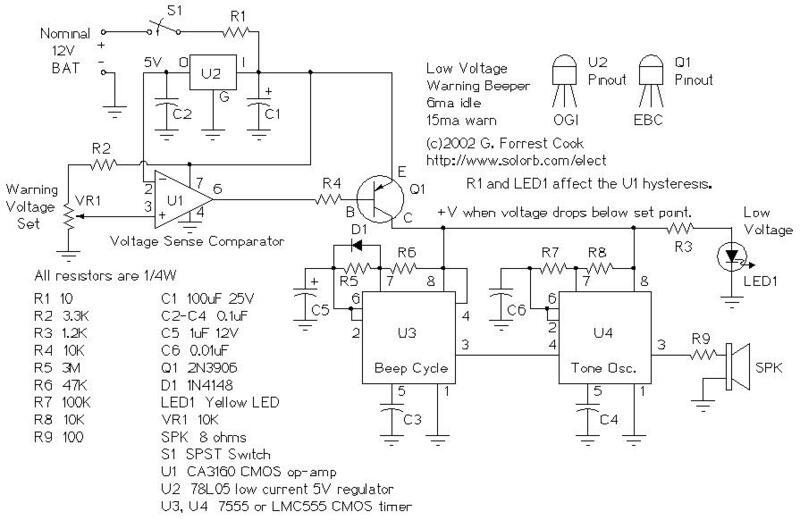 The beeper consists of U4, a tone generator, and U3, a low duty cycle pulse generator. The tone can be changed by adjusting R7, the beep rate can be changed by adjusting R5. A small amount of hysteresis is provided by R1 and the current through LED1 and the beeper, this separates the on and off points for the circuit. The circuit board was made by printing the pattern (see below) onto Press-n-peel blue circuit board transfer film with a laser printer. Etch the board, drill the holes, and assemble the parts on the board as per the board photo. Be sure to correctly orient the diode, electrolytic capacitors, ICs, and transistor. The CA3160 op-amp may be difficult to find, other low power CMOS op-amps may be substituted. A standard 741 op-amp would also work, but the idle current will be higher. 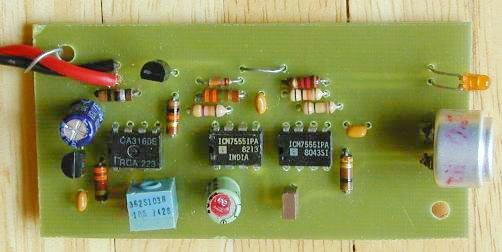 Connect the circuit to the 12V source that you wish to monitor. There should be a fuse somewhere between the battery and this circuit. Turn S1 on, if the battery voltage is above the set point, nothing should happen. As the battery voltage drops below the set point, the LED will light and a periodic beeping will come from the speaker. If the beeping becomes annoying, turn off S1. Be sure to charge the battery soon, excessive discharging will shorten the life of most rechargeable batteries.